I prayed for all of you with our Holy Father this evening! On my way back home from Grand Central. Little Angels Choir practice for today's English mass - 2 PM to 3 PM at church. (Children who haven't attended any practice need not to come). On behalf of our Mission Director Fr. Thadeus and all the thirunnaal prasudenthise, we would like to welcome all the parish members, their families and friends to the St. Mary's feast celebrations starting today through Sunday. Please see the attached thirunnaal flyer for details. There will be a sign-up sheet passed during the mass on Friday and Saturday for next year's Prasudenthis. 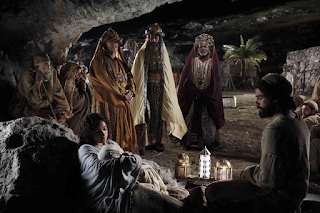 As our Achan has announced in the church, unlike the previous years, we want maximum parish members to become presudenthis for the coming years and conduct the feast with their participation and involvement. The fee will be $200/person. The interested members shall sign-up their names today or tomorrow. The names will be announced on this Sunday (09/13/15). If you cannot come on Friday and Saturday for the sign-up and would like to become a presudenthi for next year, please let one of the Trustees know of your interest. The signed-up people will be called-upon on Sunday for 'Presudenthis vazhikal' after the procession. Please know that there will be no additions of names after this Sunday. 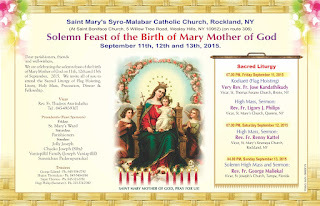 Once again, we invite all of you to the feast holy mass and seek the abundant blessings from the holy mother. PS: This years presudenthis will be blessed before Mass on Friday and Sat. Little Angels Choir practice today 6 PM to 7 PM. 09/06/15 - Sunday after mass 12 to 1 PM. All the choir members must come for the practices. 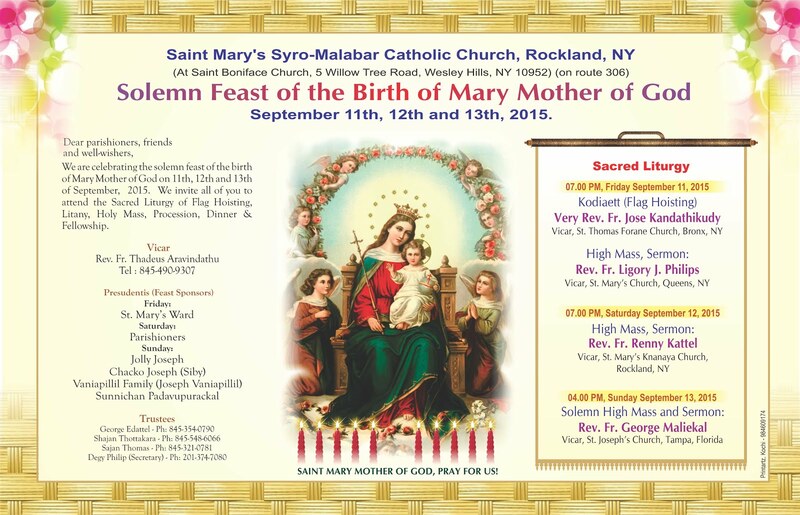 The Spiritual Life Team, invite you to the Holy Mass, and Eucharistic Adoration at St. Mary's Syro Malabar Catholic Church (at St. Boniface Catholic Church) on friday the September the 4th. As announced the Holy Mass is at 7:00 PM followed by novena and Eucharistic Adoration. I reached home safe by 6pm after my trip to Kerala. I had a good vacation. Thank God! Jerry Amaldev show proceeding goes to the poor. 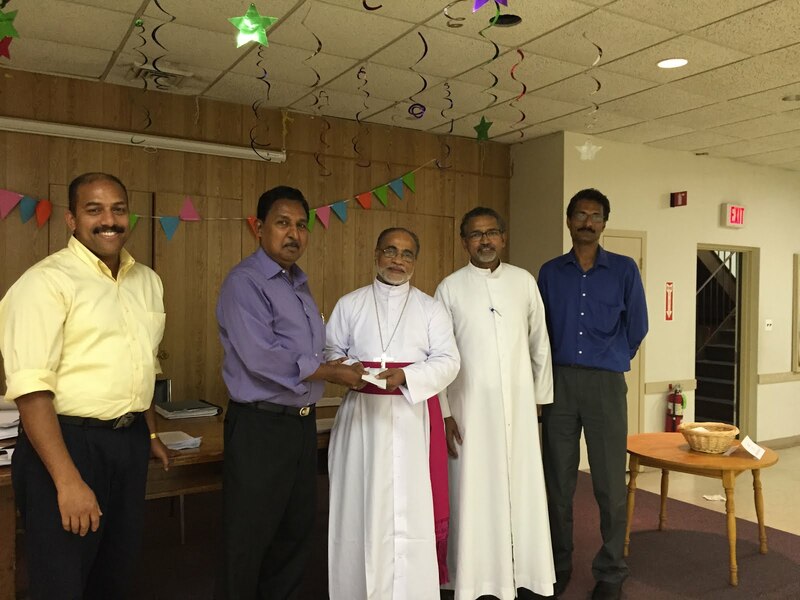 The St. Mary's Syro-Malabar Mission in Rockland has made a donation for the poor in Gorakhpur. Earlier, in last year, the church had initiated a Missionary partnership with the north Indian mission diocese of Gorakhpur. The money was donated from the fund raised through the recent successful Jerry Amaldev show. 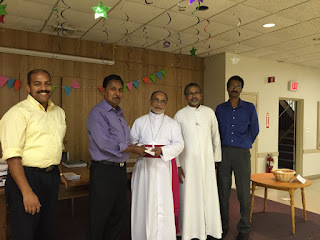 The check was given by the show committee chairperson Mr. Jacob Chooravady during the General body meeting of the church on Aug. 2nd, 2015 to Mar Thomas Thuruthimattom, the Bishop of Gorakhpur diocese during his visit to the Rockland Mission. Mar Thuruthimattam has offered the Mass with the St. Mary's church to thank God for all the prayerful support in the past year. Members have made collections to build up an orphanage in Gorakhpur for about 40 street children. The St. Mary's mission Director Fr. Thadeus said that the partnership with Gorakhpur diocese is an important call from God that all participate in the Mission of the Church in small and big ways, through prayers, visits, service and donations. During the meeting, the general body payed its tribute to the Late A.P.J. Abdul Kalam, the 11th President of India who passed away on July 27th. Trustee Sajan Thomas in his speech, paid respect and homage to Dr. Kalam and remembered that he was a people's president who was loved and admired by all masses of India and abroad. The general body observed a minute of silence to pay its respect to the late President. There will be a practice for the 'Little Angels choir' by Jim Coakley on Aug, 16 after mass at 1.30 to 2.30 PM. The practice is in preparation for the St. Mary's feast day mass on Saturday (9/13/15). All the angels must attend. Thanks. I had a good trip to Kochi. I am with my family. If you need to contact me or just to say hello either use email or call at my Vodafone cell # 0017034511864. Look forward to returning to our church on Aug 25. Let's be mutually united in prayer. Have a blessed summer time! Mr. Philip Chacko Chenkroth, father of our parishioner Laila Shaji, has passed away on Aug 2nd in Perumthuruthy, Thiruvalla. Shaji Jiseph and Laila have left to Kerala to attend the funeral. As a community, we support Shaji and Laila in this difficult time and pray for the departed soul. passed away in Mumbai, India last night. There will be a prayer at Clement residence this morning at 11.am. As a community, we support Francis Clement and his family and pray for the departed soul. Let us all pray for Bishop George Ninan, CSI (Protestant) who passed away at age 80 in Nyack. Please see the details of the Wake and Funeral services in the attached PDF file. Please pay respect and express your sympathy to the family according to the program given at your convenience or remember the departed soul in you prayers. Please see the info about the Wake and Funeral Mass of Annamma Devasia Panachickal. Please see the attached file for the details about the Wake and Funeral of Annamma Devasia Panachickal. This is to you that the mother of John Devasia, Annamma Devasia Panachickal, has passed away at the age of 96. There will be a prayer service at 7pm today at his residence (18 Clay St New City, NY 10956). On behalf of the Syro-Malabar community in Rockland, we extend our condolences to the sorrowing family and prayers to the departed soul. On June 28, Sunday, from 3.00pm to 6.00pm at St Mary's Syro Malabar Catholic Church, (at St Boniface) 5 Willow Tree Rd, Wesley Hills, NY 10952, there will be an opportunity for music lovers of all religious and cultural backgrounds to meet and chat with the famous music director Jerry Amaldev. The program is named "Music Appreciation, New York, with Jerry Amaldev". This is meant for all who love to listen to good music, wish to know about the birth of different songs, comparison between Western and Eastern music, Hindustani and Carnatic music, light music, folk music, popular-cinema music, classical music including the musical career of Jerry Amaldev for the past 40 years. All (including youth) are welcome to attend and there will be no entrance fee. There is going to be a dinner reception for Jerry Amaldev at Karavally Restaurant 416 NANUET MALL SOUTH, NANUET, NEW YORK 10954 Tel: 845 215 9794 on the same day (June 28, Sun) at 7.00 pm to honor and celebrate his 75th birthday. It will be a self-paid sit down buffet dinner. There shall be only 60 seats available for the dinner.